AFF makes connecting / transfer sleeves to join movable equipment such as a vibrating sifter, to other equipment. Additionally, we specialize in designing and fabricating a very wide range of flexible, breathable and non-breathable connectors. We select fabrics (FDA-approved for food contact) for the best performance in your application. Each item is custom made for a precise fit, and we keep track of your designs for future orders. RCN is a FDA approved material that is commonly used in food/pharmaceutical applications. RCN is an excellent material for product transfer sleeves. The rubber coating provides an excellent non-stick surface for sticky/wet materials. Cordura Nylon is an extremely durable material that is used to transfer abrasive products. 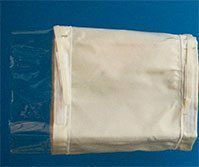 AFF stocks a wide variety of anti-collapse rings that are sewn into sleeves & filters that operate under negative pressure. 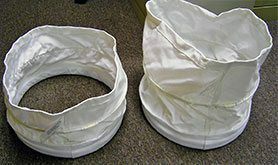 When connecting either a transfer sleeve or filter bag to a collection drum, a skirt sewn to the inside will keep the dust/product from building up around the rim and creating a mess every time you empty the drum. We can cut slits into the hem on any of our materials which provides not only a cleaner look, but also makes it easier to attach the sleeve.